Avira AntiVir version 10 has been released, and to the joy of existing Avira security products subscribers (i.e. 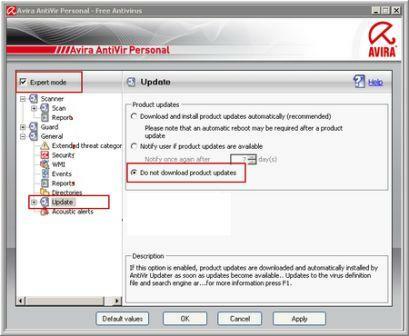 Avira AntiVirus v9), they can receive free upgrade to corresponding product of Avira AntiVir v10. In fact, all Avira AntiVir Premium and Avira Premium Security Suite of version 9 will be forced to upgrade to latest version. There are changes in user interface in the new version 10 of Avira AntiVir program in order to offer more features and functions. For user who does not want to upgrade to Avira AntiVir version 10, and wish to stay and continue using Avira AntiVir version 9, here’s the hack to disable automatic upgrading of Avira products. To stop Avira AntiVir v9 to automatically download and update itself to Avira AntiVir v10, open up Avira AntiVir v9 program’s interface, and click on Configure AntiVir option. Click and tick the check box for Expert mode to reveal advanced options. Then, expand General tree view, and go to Update. Select the radio button for Do not download product update. Click OK to save the settings. With the setting, Avira AntiVir 9 will continue to update the virus signature database, but not program. For users who have already updated to Avira AntiVir 10, the only option is to uninstall the new Avira version application, through Control Panel or Avira Antivir Removal Tool, and then reinstall Avira AntiVir 9 again. Unfortunately, Avira does not provide download of setup installer for old version, so user will need to download the setup installer from third-party source, such as oldapps.com.